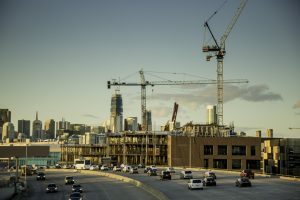 San Francisco, whose minimum parking requirements for new developments date to the 1950s, is preparing to do away with them, becoming the first major U.S. city to do that. Legislation introduced this week will do away with requirements for minimum numbers of parking spaces at new developments. City leaders say it won’t mean dramatic changes, as they’ve been working for some time to reduce car use by residents and offer developers alternatives, including providing more bike parking instead of parking for cars. Parking maximums will not be affected.